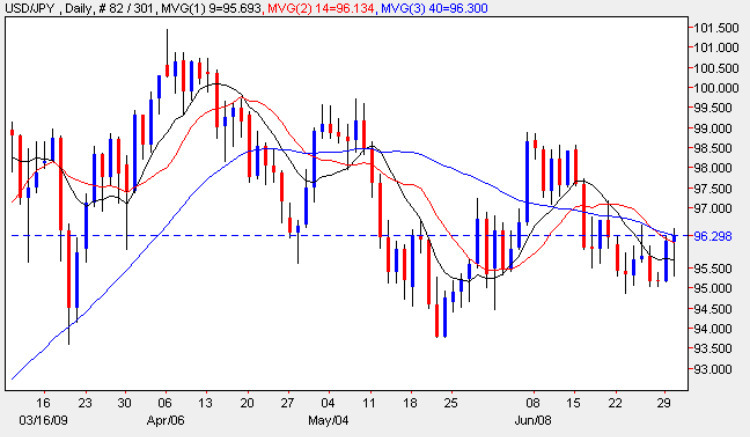 The yen to dollar currency pair never fails to exasperate and bore in equal measures and yesterday’s candle came completely out of the blue ending the day as a wide spread up bar racing through the 9 day moving average while finding some resistance at the 14 day average. This week is turning into a reality for many in the markets as the various items of fundamental news on the economic calendar are released revealing that the so called “green shoots” are turning into a figment of most people’s imagination. For Japan this week sees the release of the all important Tankan Survey which is due out during the early hours of the Asian trading session and the markets will be looking for any sign that the worst of this recession is over following the worst reading on record last time around. Broadly speaking the Tankan falls into two elements and in simple terms is a diffusion index, the first of which is based on large manufacturers and the second of which is based on large businesses (excluding manufacturing). It is a closely watched piece of fundamental news and something that the BOJ factor into their interest rate decisions and fiscal policies and is therefore highly significant. The forecast for tonight is for the manufacturing side to come in at -43, better than last time at -58 whilst the non manufacturing is forecast at -26, against a previous of -31. Both are therefore indicating a slow improving picture but with still a long way to go to break above the critical crossover line at zero which then begins to indicate an amelioration. Meanwhile all the US data is covered for you in the euro to dollar fundamental site.